3. What’s your favorite soup garnish? You know, beyond crackers. I have a recipe called Pumpkin Parsley Seed Garnish that could be easily overlooked, but I tell you when you toast those pepitas and grind them with some garlic and greens – soup’s alive! You get crunch and punch. Okay. YOUR TURN. Type your answer as a comment to this post. 4. Contest ends at MIDNIGHT on Monday September 27 . PLEASE check your email on September 28. The junk mail folder and everything. We’ve been having some trouble with lost emails to winners. The winners will be chosen by random.org. If you don’t respond to your “winner” email within 48 hours, we will choose a new winner (tough love…). The fourth edition of Feeding the Whole Family (click the title) is on pre-sale for 40% off! Or is it 42%? Whichever, deal of the day. 45 new recipes in this baby. Shipments start in early November. I love cumin salt and a drizzle of olive oil or cream on top of many of my soups. yes, bring on the soup! I love the pumpkin parsley seed garnish from Feeding the Whole Family also. And, incidentally, I LOVE the FTWF cookbook. Mine is so well loved it is falling apart, so I have ordered the new revised edition and can’t wait to get it!! This is literally my favorite cookbook ever. My favorite soup is Pork Chili Soup with a dollop of sour cream and chopped cilantro! I like to add a little spoonful of salad dressing for some zip! Fried herbs! Especially sage. Crunchy fried sage on top of pumpkin soup is perfection. My favorite soup garnish – yogurt and cilantro. They add a zing that compliments many flavors! OK I’m a below-average cook, but I can make soup!! That said, I have one secret ingredient for my turkey chili that I only give to those lucky few who have eaten it. Sorry. Sorry, can barely get the soup made so no garnish. But I do love fried shallots! Just last night I made the Three Sisters Stew recipe out of FTWF with almost 100% of ingredients sourced from my Garden Treasures CSA. We had it served over/topped with Trader Joe’s version of Fritos – like Frito pie. My 8 y.o. daughter ate two bowls! Yum! Homemade sourdough croutons in garlic-infused olive oil! Favorite soup garnish is polenta croutons! Balsamic vinegar. Not really. I don’t have a favorite. I’m not that creative. I just follow recipes. That’s why I love Cookus and your book!!! I hope I win the soup book and am going to buy 2 of your books and give one to my daughter. Uh, maybe I should talk with her first b/c I think I already gave her your book(s). A dash of lemon juice just before serving, brings out all the flavors! Yogurt and ginger on carrot soup. Homemade croutons or garden fresh cilantro. Mmmmmm soup!! I live near the coast, so I like to collect fresh seaweed, dehydrate it, and then crumble it on top of soups. I also like to sprinkle a little nutritional yeast & maybe some toasted sunflower seeds, depending on the soup. Good old grated fresh Parmesan cheese. I like french fried onions (the canned kind) on soup, with a little of the appropriate fresh green herb. I love plain yogurt in place of sour cream on borscht, chili, black bean soup. I use plain greek yogurt to boost the protein in my soup lunch/dinner and always sprinkle cayenne on top of the yogurt for a wee kick! I like a big handful of parsley or cilantro, depending on the soup. I like to drizzle just a tad of a fairly expensive balsamic vinegar on a creamy vegetable soup. I love soups! All kinds. My favorite garnish is crumbled feta cheese and a sprinkling of za’atar spice (thyme, sumac, sesame). Yum! Sour Cream or whole cream just mellow everything nicely. Funny, I’m making soup right now! CSA veggies and home cooked beans. I love a spoonful of homemade pesto on most veggie soups, or Sriracha in chicken broth based soups…. If it’s a cream soup & I’d like some crunch, a few toasted breadcrumbs with grated parmesan will do it. Generally: fresh herbs (cilantro, parsley), spring onions & toasted garlic (crunchy yum). I love to put gremolata in soup if it doesn’t compete with other flavors. Otherwise, I just eat the soup as made and don’t use any toppings. Cultured vegetables! So yummy over and mixed into any soup. Seriously good! Finely chopped kale and a sprinkle of parmesan. A dash of plain soya yoghurt (much cleaner than dairy yoghurt and also because I’m lactose intolerant!) and a snipping of fresh chives. Takes the soup from good to awesome! Brown butter on cauliflower soup is delicious. We love soup!! Topped with chopped fresh herbs, or a lemon squeeze, or a drizzle of virgin olive oil. It’s all good! Garlic croutons and/or a splash of olive oil, now I’m hungry! A mixture of parsley, dill, garlic, salt and lemon zest…think it’s a variation on “pistou” or something?? I’m making pistou and variations as I try to use up my garden basil before it’s done for the season. Really good in soups. I like a little sauerkraut on top of my soup. Or jalapeno peppers. 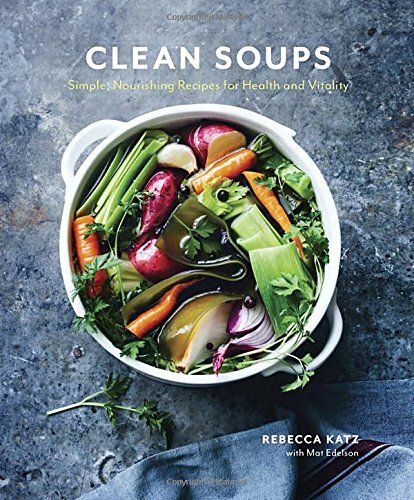 This soup book looks fantastic! I love the pumpkin seed garnish! Also love homemade croutons. And can’t go wrong with fresh cilantro or fresh basil! Bring on the soup season! I love your books! I prefer pepitas or nutritional yeast as a soup garnish! Yum!!! Love soups, like to add greens and Parmesan Cheese. Also either a pat of butter or some olive oil. But I’ll have to try some of these already listed. Olive Oil, fresh basil and garlic (of course). Plain yogurt, herbs that compliment the soup, and/or homemade croutons. Greek yogurt, chopped herbs, and a small pinch of coarse black pepper over the top. My family loves Parmesan cheese on soup, it would be nice to get more creative! Cilantro, fresh sliced tomato, lime juice, and sour cream on Black bean vegetable soup! I drizzle truffle oil on blended soups (like puréed cauliflower, leek and celery root soup). Rebecca Katz’s cashew cream topping on top of her ginger-carrot soup! Whether I win it or buy it, I will get it! Thanks. A slice or two of avocado… mmmmm! Plain yogurt w dried kale & apple chips. I dry both from my garden each year. Sage would be good with pumpkin too. Homemade croutons baked with olive oil and fresh rosemary from the garden. Your Creamy Cilantro Sauce from “Feeding the Young Athlete”. It’s a great way to cool down Green Chile Chicken Soup. If I have pepitas on hand, I add those, too! Oh, and maybe some fire-roasted corn….. I love some oven toasted corn tortilla strips in most soups and salads. My cousin swears that tomato soup should have popped corn floating on top. I love a combination of nuts, garlic, an herb, and citrus zest. Pistachios and almonds are my favorite of all nuts to use; always garlic; the herb can be parsley, cilantro, sage, or thyme; any citrus, though I am fondest of lemon and orange in this context. But adding grated hard (especially a sheep’s milk) cheese would not disappoint me! Hm…if it works with the soup, I love a bit of olive oil, pine nuts, and a sprinkling of Parmesan on top. Yum! I always loved my mothers beef stew.